Hi, welcome to my site! My name is Cam McPherson and I'm from Melbourne, Australia. I've spent a few very enjoyable years backpacking around developing countries, spending quite a lot of time in Latin America, Africa and Asia..
And Mongolia is the only place I keep going back to! Since first experiencing those wide open spaces, beautiful landscapes and nomadic people, I've kept going back to Mongolia again and again. The freedom you feel being out there, knowing you can head in any direction and not hit a fence for a thousand miles.. I even met my wife in Mongolia; we were both staying at the Golden Gobi hostel in 2008 (Ulan Bator not being the most romantic city you can meet in, but there you go!). It's funny going back to Golden Gobi together and re-living old times. 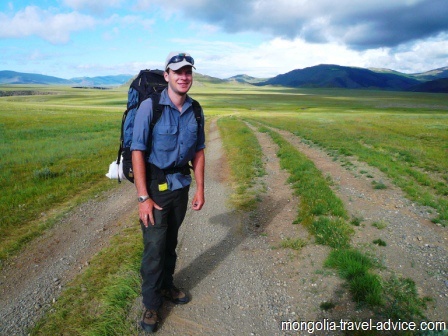 It has been great fun building Mongolia Travel Advice. I've particularly enjoyed watching the Mongolian-owned companies I recommend learn and grow over the last couple of years. They've emerged to be among the better players in what is still a pretty immature tourism industry, and they've also become good friends who keep me updated on all the latest developments in the industry. This site is still a bit of a hobby of mine, and marked my first attempt at a website. I want to keep this website REAL, amateur, and uncommercialized. The way websites used to be! Have a look around my website. Most of the stuff you'll want to know about your trip to Mongolia will be here somewhere. You can contact me with any questions, I will generally get back to you within a couple of days and if I don't know the answer myself I probably know someone who does.